How time flies it’s nearly SLA annual conference time again, it feels like just a few months ago I was preparing to go to Chicago. Two things last week prompted me to get my conference head on: the announcement of SLA Europe’s ECCAs and discussions with colleagues about the Fellows and First Timers Meet on 8 June. So I’ve spent the weekend pulling my schedule together, and updating my tips and hints for attendees. I can’t claim to have thought of all these things myself and I’m still picking up tips each time I go to conference. I’ve listed some helpful references at the end for those who want to read more widely. Packing: bring comfortable shoes – you will be doing lots of walking around large convention centres and hotels as well as exploring the host city. Bring clothes that allow you to dress in layers – it’ll be hot outside, cool and or cold, in the air conditioned convention centre. Leads, chargers and batteries – vital if you rely on your smartphone, tablet or laptop for keeping in touch or making notes. Plus don’t forget an adaptor plug if you’re travelling from outside North America. Pre-conference networking – use social media to get in contact with other attendees and to plan your schedule. Check and see if your division offers any mentor/buddy system, if they don’t email and ask if you could set up an informal mentoring scheme. Plan your schedule use the online planner to set up your schedule either online, or in Outlook. Choose all sessions that interest you and don’t feel you have to attend only those that your chosen division(s) run. For each session have a plan B, C and D in case there are no seats left when you get there, or you decide it isn’t what you thought it would be so you walk out early. Plan B, C and D can include visiting exhibition hall, taking a break, getting something to eat or going to another session. Be aware of session etiquette – it is ok to walk in late or to leave early from a session (so non-North Americans take note this is ok). 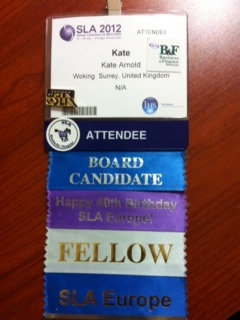 Badges and ribbons – you’ll get a name badge when you register which you can either pin on or clip to a lanyard. Whatever you do make sure your name is easily visible, and if you use a lanyard a good tip is to write your name on the back of your badge as it will inevitably twist around and display the blank side (thank @bethanar for this tip). You’ll find there’s space for ribbons on your name badge, so take advantage of any that apply to you and get them from the Information Booth. If you’re a first-timer make sure you pick a ribbon up, it’ll be a great ice breaker. Plan your introductions – you’ll be meeting a lot of people and will need a succinct and memorable way to describe yourself and what you do. You’ll be more confident if you’ve prepared your answers to questions such as where you work, what you do and what you’re aiming to get out of conference. Plan breaks and pace yourself – days are long and busy, from breakfast meetings at 7:30am to parties that go on until after midnight. You need to remember to pace yourself, take a few breaks, even if it’s just a walk around the block. Have fun – above all else enjoy yourself, immersing yourself in a wonderful bubble atmosphere where you’ll meet some great people, learn a lot and hone your networking skills. Over the years many people have shared tips and hints on attending SLA conferences. To list them all would take a lot of space. So here are a few worth looking at: Stephen Abram in 2006; SLA tips on conference success; SLA on using social media to enhance your conference experience. Plus take a look at the blogroll from 2012 conference. Free Range Librarian’s experience of survival tips for ALA conferences. iLibrarian’s top 20 tips for surviving library conferences.